Quite often when we think of inking, browns and an aged appearance come to mind. But you can also effectively use inking with brighter, more colourful layouts. In this layout, Kelley uses blue ink extensively to carry a water theme. It's such an easy technique that can be adapted to any theme. 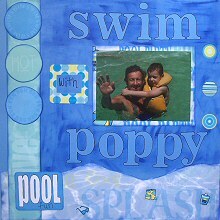 This layout was created using Reminisce Water Paper Pack (Pool Blocks Paper, Wet N Wild Paper, Pool Party Paper, Splish Slash Paper and Fun In The Sun Paper), Reminisce Pool Party stickers, blue cardstock, blue ink, a blue pen and Heidi Swapp Alphabet Masks. The blue cardstock will form the background for both sides your layout. Using blue ink, heavily ink the cardstock to give it dimension and texture. Set aside to dry. Tear strips of Reminisce Wet N Wild Paper so that the tear follows the shape of a wave. Lightly ink the torn edges with blue ink and when dry, adhere across the bottom of both pages. Cut both the Dive and the Splash stripe from the Reminisce Splish Splash Paper and ink the edges with blue ink. Adhere the Dive stripe down the left side of your left-hand page and the Splash stripe down the right side of your right-hand page. Cut out six circles from the Reminisce Fun In The Sun Paper and ink the edges with blue ink. When dry, adhere three at the top of each stripe, as shown in the layout above. Mat your photos with Reminisce Pool Party Paper and ink the edges with blue ink. When dry, adhere in place with one photo on the left page and two photos on the right page. Now focus on the left-hand page. Use Heidi Swapp Alphabet Masks and blue ink to create your title, as shown in the layout above. Place your bridging word (such as with) inside a slide mount stickers from your sheet of Reminisce Pool Party stickers. Cut out one of the word blocks from Pool Blocks Paper and outline both the letters and the block with blue ink. Adhere to the bottom left corner of your page. Now focus on the right side of your page. Cut out one of the word blocks from Pool Blocks Paper and outline both the letters and the block with blue ink. Adhere to the bottom right corner of your page. Using your pen, also add journaling down the right side of your page. Finally, finish off your page by strategically placing Reminisce Pool Party stickers around your page.